In the past, the paradigm of robotic rover exploration was to have a single, high-value robot, operated by a large team of dedicated support staff. 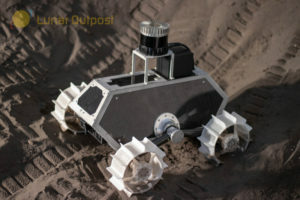 Lunar Outpost envisions their groups of Prospectors, dubbed Autonomous Lunar Prospecting Swarms (ALPS), being used for workforce multiplication, allowing a single operator to direct multiple robots and performing most or all of their tasks autonomously using AI and decision-making algorithms. This changes the balance of what can be done in space – autonomous robots don’t need to take breaks while their human operators eat or sleep, and ALPS will have the ability to map many times the area of a single rover.